People in the San Francisco Bay Area continue to show a growing interest in visiting China and exploring the country's culture, history, natural wonders and lifestyles, said tour operators specialized in the U.S. region Monday. "We have attended the show for several years to promote our travel products. There's an increasing interest from American people, including Chinese Americans in the Bay Area," said Wang, president of Chinatour.com International Inc, a Southern California-based tour operator. With a big picture of China's Temple of Heaven hanging at the booth as background, Wang handed out thousands of brochures and flyers at the two-day exhibition over the weekend. "We provide both high-end luxury tours and budget tours for young people," he said. "Those retired customers tend to choose long haul tours, such as Yangtze River cruise, which is very popular. Young people are usually attracted to short tours, such as week-long tour to Beijing, Shanghai and Xi'an." Cynthia Chang, who got a monkey bookmark, said she had always wanted to visit her father's hometown in east China's Jiangsu Province. As a second generation Chinese American, she said what attracted her the most was China's history and culture, as well as food. "The Bay Area is a very important market for us. It's one of the most affluent regions in the country and people here are generally more familiar with Chinese culture because of the large Chinese community," said Emma Ma, who works for the Los Angeles office of CNTO, which is tasked to promote tourism to China. This year, CNTO worked with three local travel agencies -- Chinatour.com, Access Asia Tours and China Travel Service, as well as two airlines -- Air China and Air Canada -- to present various travel routes at different price points to China. "The classic destinations for those tourists who have never been to China are the 'Golden Triangle" -- Beijing, Xi'an and Shanghai," said Napio Asahara, manager of sales and operations at Access Asia Tours, a North America-based tour company specialized in customized private tours to China. "For those who plan to visit China for the second or third time, we have noticed an increasing interest in Silk Road, or Tibet," she said. Thanks to CNTO's overseas promotion of the Silk Road tourist destinations in the past few years, several travel itineraries based on the ancient trade route have been developed and highlighted in the brochures at the show. Another successful example is Sichuan Province, which has been actively promoting the province's tourist sources in the United States in the past two years, said Wang. "When we attended such travel shows, we were often asked about panda or Sichuan cuisine," said Wang. "I can see there's an increasing interest in traveling in Sichuan." 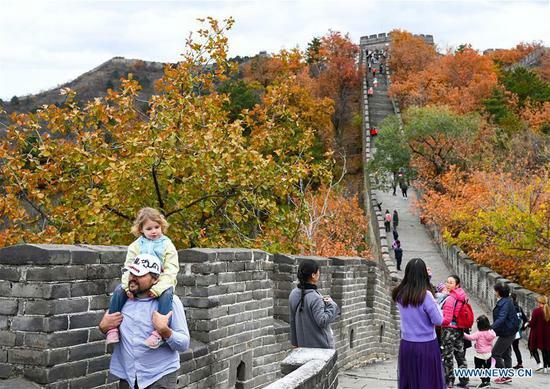 China's inbound tourism remained steady in 2018 when a total of 141 million inbound visitors were recorded, up 1.2 percent year-on-year, according to figures from China's Ministry of Culture and Tourism. "To welcome more American tourists in China, we tour operators need to develop in-depth tour experience," said Wang. Last year, his company partnered with Shandong Province to add Confucius' hometown and Qingdao to their existing tour routes from Beijing to Shanghai. Aside from being a "time capsule of ancient cultures," China also is a "monumental stage showcasing modern miracles," said Wang. "It's a unique experience for overseas tourists to see the contrast between the ancient Chinese culture and its modern entrepreneurial spirit."